Mary Roshon, 93, of LaRue died peacefully and unexpectedly in her home Tuesday, February 11, 2014. She was born January 13, 1921 in Marion to the late Thomas and Nellie (Stallings) Daniels. She was raised throughout Marion County and attended a number of schools. In the summer of 1940, she laid eyes on a handsome young man “with the prettiest eyes and most beautiful neck muscles” driving a tractor down her road. Bob Roshon was that young man and she never had a desire for another. They were married in the Richwood home of her sister August 16, 1941 and made their home in Hardin County until Bob preceded her in death March 23, 1998. She moved “into town” in 1999 and enjoyed being able to drive and live on her own, surprising everyone who learned her real age. 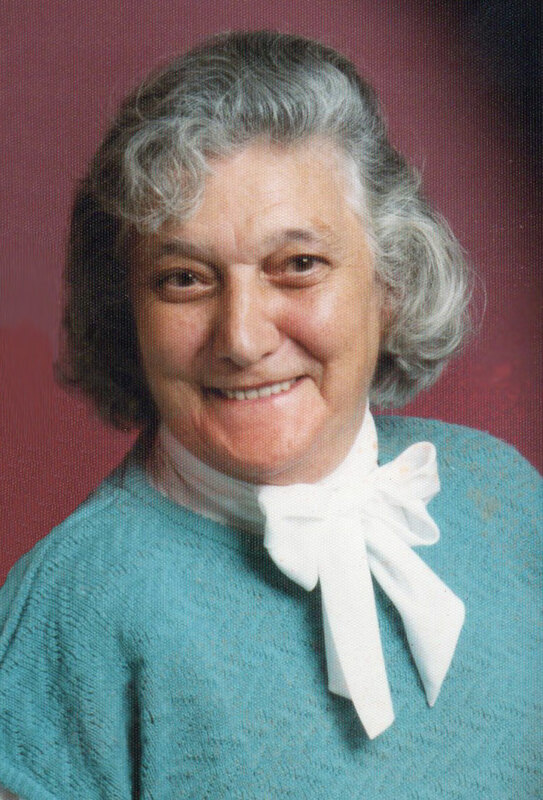 Mary raised her family and helped Bob on the farm until going to work for Essex Wire which became United Technology from which she retired after 25 years. She was a former member of VFW Post 333 Auxiliary and worshipped at Hepburn United Methodist Church. In recent years, she looked forward to “The Pickin and a Grinnin” get-togethers of the Victory Jamboree. She enjoyed reading, puzzle books and a lively game of cards, be it 500 Rum with friends and family or refusing to get started with the day until she had won a hand of solitaire. She loved her Lord and Savior Jesus Christ and spoke to Him in prayer and read His Word every day. She will be remembered for being a fun-loving lady who loved to laugh, share and reminisce. Mary was an excellent cook whose pie crusts were second to none. She could whip up a great meal in a moment’s notice. Drop by with some fresh picked berries or a few apples, and she would have a pie or dumpling made before you knew it. While she loved her life on earth and lived it to its fullest, she longed for sweet reunions in her eternal home. In addition to her parents, Mary was welcomed into heaven by her husband of 56 years, Bob Roshon; her girl, daughter Dixie Boblenz; and all of her siblings, Robert Daniels, Thomas Daniels, Mildred Evans, Virginia Rainsburg and Leona Zachariah. Mary is survived by her son, Rev. Ken (Joy) Roshon of Safford, Ariz.; grandchildren, Dee (Rick) Murray of Prospect, Brenda (Todd) Buckland of Green Camp, Nathanael (Jennifer) Roshon of Bucyrus and Luke Roshon of Tempe, Ariz.; five great grandchildren, Matt (Kristin) Murray, Katie Phipps, Amanda (Adam) Utzinger, Amber Buckland and Austin Buckland; three great-great grandchildren, Cassidy and Bella Murray and Lincoln Utzinger; and son-in-law, Wayne Boblenz. “Aunt Mary” also adored each of her nieces and nephews and their families and was grateful for their kindness and always looking after her. Mary’s family will receive friends on Friday, February 14 from 4-7 p.m. at the Stofcheck-Ballinger Funeral Home in LaRue where funeral services will be held on Saturday at 11:00 a.m. with Pastors Calvin Waugh and Denny Livingston officiating. Burial will follow in LaRue Cemetery. Memorial gifts may be made to Hepburn United Methodist Church, c/o Linda Van Dyke, 10133 Wildcat Pike, LaRue, OH 43332 or a charity of the donor’s choice. TO THE ROSHON FAMILY. MARY WAS A SWEET LADY, AND ENJOYED WORKING WITH HER AT UTC. SORRY FOR YOUR LOSS. I loved Aunt Mary so much, she looked so much like mom. After mom died I liked calling her and talking about our families. I have great memories growing up with Kenny and Dixie. I wish you all my love and condolences.